The Indian & Colonial Research..
OLBC of Groton is just a quick 10 minute drive from Downtown Mystic and located right off the 95 not far from the Thames River. 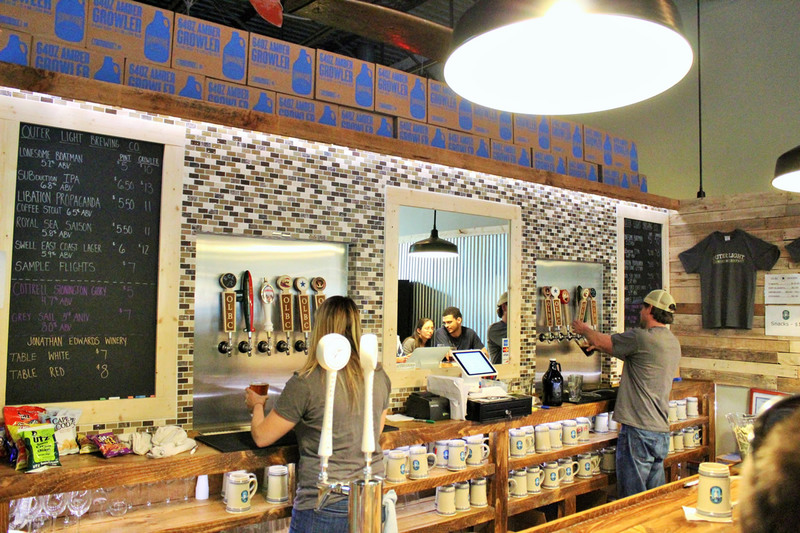 The Open air tap room (located in an industrial like center) is the perfect place to unwind after work over a pint with friends or sit back with a flight of four beers on a Saturday afternoon. There’s even wine, but more about that later. They’re pouring 3 standard brews plus a rotation of seasonals. We had a fantastic visit shortly after their soft opening and were welcomed by Tom and his wife who were behind the bar. You can tell they care as much about their customers as they do their craft. 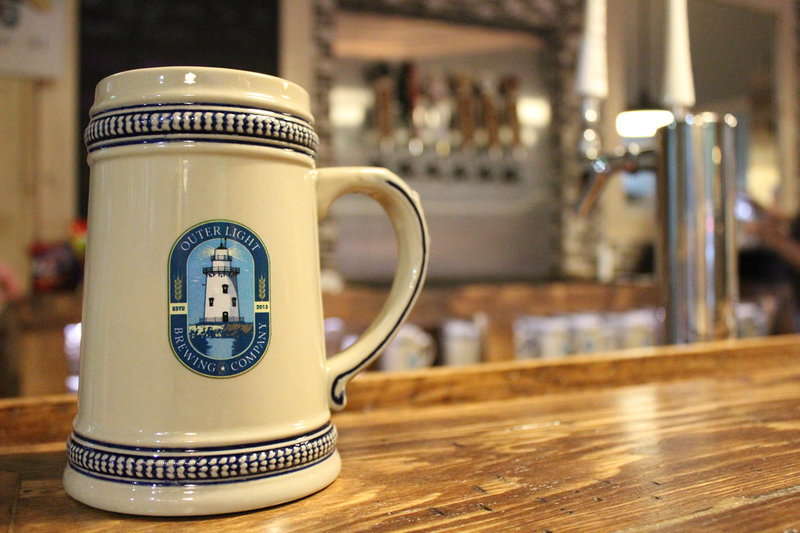 If you’re a local or just stopping by for a visit, be sure to add OLBC to your list of things to do in the Mystic area! Cheers! Tom, what’s your official title or role in the business? 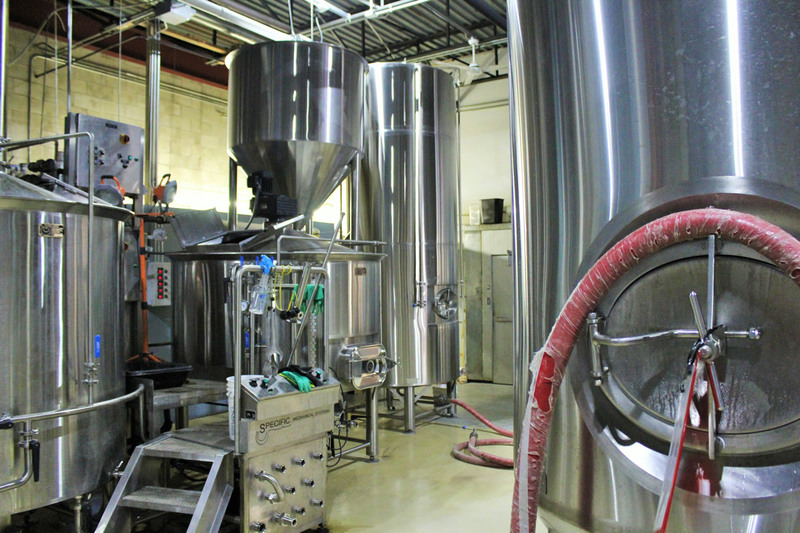 Tell us a little about your background and what got you started in the micro brewery biz. I am co-owner/president/we really don’t go too much by titles. My role is to wear multiple hats, run the business, help brew, bar-tend, rep our beers, sell our beers etc. I am a meteorology major for my undergrad, got into environmental engineering and somehow not the weather, switched over briefly to marketing, and lastly I am finishing a career in the energy management industry. I’ve been brewing since my freshman year of college, totally legal in my book at the time, and had the itch to start a brewery in 2006, but had no idea how to run a business. I turned to business school, and a little over 3 years after graduation we finally have a brewery with its door open! We know creating a great craft brew is much more than a good recipe. It involves a huge laundry list of practices by many beer-knowledgeable folks. Give a shout-out to your awesome team. Who are they? We have my co-owner Matt Ferrucci and Head Brewer Tyler Cox. Matt and I go way back, mutual friends through who is now my brother in law (I married my best friends wife’s sister.) We were fortunate to come across Tyler late last year and stole him up to CT from North Carolina, right in time for the brutal winter and one of the coldest February’s on record. Tyler brings a brewing style straight from North Carolina that I think makes a unique mark on the CT brewing scene. 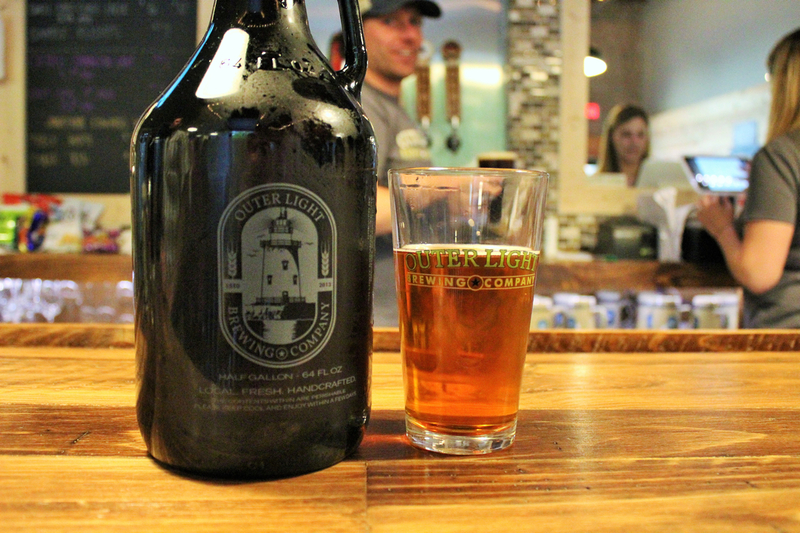 The craft beer scene is picking up in the area, what made you choose Groton? We essentially had a search narrowed down from East Lyme to Groton, knowing we wanted to have our brewery in Southeastern, CT. The location we found in Groton was a perfect place that fit so well with the surrounding towns and businesses. We have Pfizer, Electric Boat, the Sub Base, Mystic, several colleges and universities in the area. I like to say that Groton/New London is this hidden gem in CT. Southeastern CT gets it to itself, and the rest of CT doesn’t know about all the great art, music, restaurants and bars that the Groton/New London area has to offer. 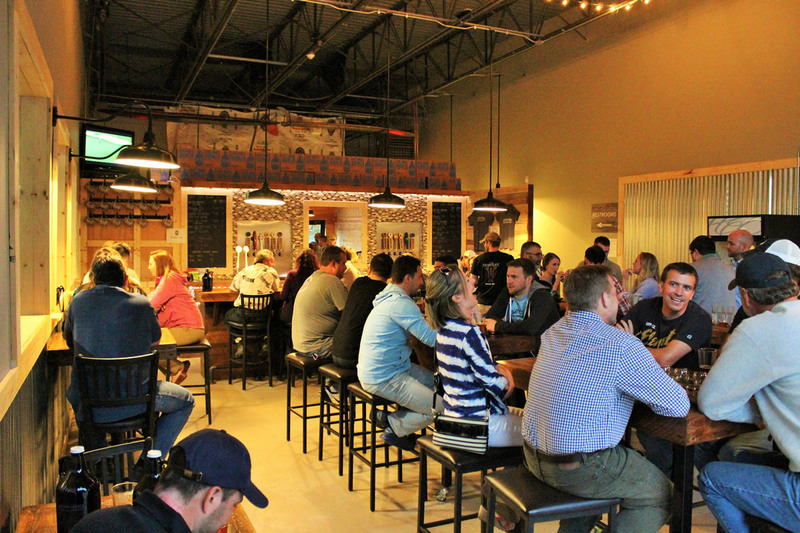 We hope it brings more attention and gives the rest of CT a reason to come visit us and the other breweries in the area while discovering all the rest there is to do. My husband and I love Stone Brew Co in Escondido, CA for their earthy atmosphere…rocks, water, fire with lush green landscaping etc. We say it’s like Disneyland for the craft beer drinker. 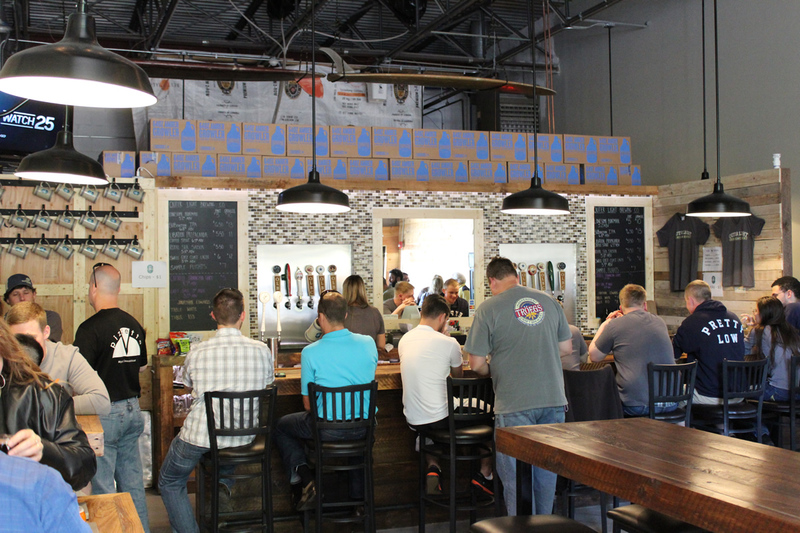 What’s your favorite brewery or most impressive brewing company that you’ve ever visited and why? I have to say it was Tofino Brewing Company in Tofino, BC Canada. I was there with my wife on a vacation/brewhouse manufacturing scope out mission. We hit Tofino to vacation and surf and met the guys at Tofino Brewing who went out of their way to give us the tour. Their operation wasn’t really impressive, it was more their resourcefulness and how they married their love for beer with their own passions in life. They were in a similar industrial condo like we are, but had rented a whole bay next door and constructed an indoor skate park. Their beers were tailored toward surfing which I could really appreciate. It was inspiration for me to keep Outer Light grounded toward celebrating our personal passions. We like to be seen as a lifestyle brewing company. We have a passion to get out there, surf, hike, camp – whatever it might be and hope people drinking our beers can make a connection with what they love and enjoy. We love your friendly collaboration with outside breweries/wineries like our other local faves Cotrell and Jonathan Edwards. Is there an upcoming OLBC event or list of other locations to sample your beers (perhaps in Mystic) that you’d like to share with our readers? We have our Grand Opening coming up May 30th. We did a soft opening on May 3rd with one beer. We’re now to a point where we are dialing in our recipes (yes, sorry, some beers may change slightly in flavor) and working to get things exactly where we want them before pushing things out too quickly. For Mystic, we just did a DPI tap takeover and we’ll have a beer dinner there in June. We are also on tap at the Engine Room and Pizzetta and we’re growing the list over time. We are on tap at many locations in and around Groton as well. Most popular beer on tap? The IPA for now. Those three letters are like a mosquito to a bug lamp for craft beer drinkers…and I’m guilty of loving IPA’s myself. The light is so pretty…but our recent limited Shoreline Series release Swell East Coast Lager just took that over. It’s an Octoberfest base we dry hop with Citra, which completely changes things. Plans to have happy hour, food, live music at OLBC? As we get things going we’ll likely try to have some live music occasionally. We can’t have food trucks for now, maybe that will change in the future. We encourage people to bring food, pack snacks, or order something in. We noticed a cool environmental post on your Facebook page about a beach cleanup in Stratford, CT run by the Surfrider Foundation. Does OLBC have any environmentally friendly practices? We did decide to use all glassware for samples and pints in the taproom instead of plastic. Being as small as we are there is not much else we have been able to do as of yet. We do however try to support a different local organization each year. We use our coffee stout, Libation Propaganda, to support that local organization each year (spreading good propaganda is the whole idea behind the name). This first year we are supporting the Surfrider Connecticut Chapter. It’s an organization I had previously volunteered with when I had some more time on my hands. They do a great job trying to clean up our beaches and bring more awareness to the issues we have in Long Island Sound. It’s all about clean water and making sure we all have access to enjoy our local bodies of water. Lastly, Is there a story behind the Outer Light name? Tom and Matt have had a passion for better tasting beer since their college years. Becoming friends through a mutual friend, they spent their post-college years taking full advantage of the bounty of New England’s outdoor offerings – from hiking Connecticut’s trails and surfing Rhode Island’s coasts to hitting the slopes up north. No matter the season or locality, Tom and Matt celebrated the experience of the local beers, but they always wondered what could be. The late 90s and early 2000s still had a limited selection of local beer and flavor, so the pair teamed up to brew together and share their offerings with friends. One fall afternoon, using a borrowed boat on its last legs, the pair escaped the pressures of their corporate careers and business school commitments to chase some late fall blues on the Sound. After dropping anchor, conversation turned toward a mutual distaste of overwork and under-appreciation in their respective careers and what they could do to control their destinies. The common denominator for change always led back to beer. Soon after, a squall blew through and Tom and Matt found themselves half a personal day shorter in deteriorating weather conditions without a single fish to show for it. To make matters worse, the unreliable outboard lived up to its name and a fog as thick as sheet was rolling across the Sound. After a quick home-brew to ease their nerves, the pair exchanged turns paddling toward what they thought was north. After an hour battling against the tide, they spotted a bright beacon in the distance – Saybrook Breakwater Light – or the Outer Light as it is know to locals. 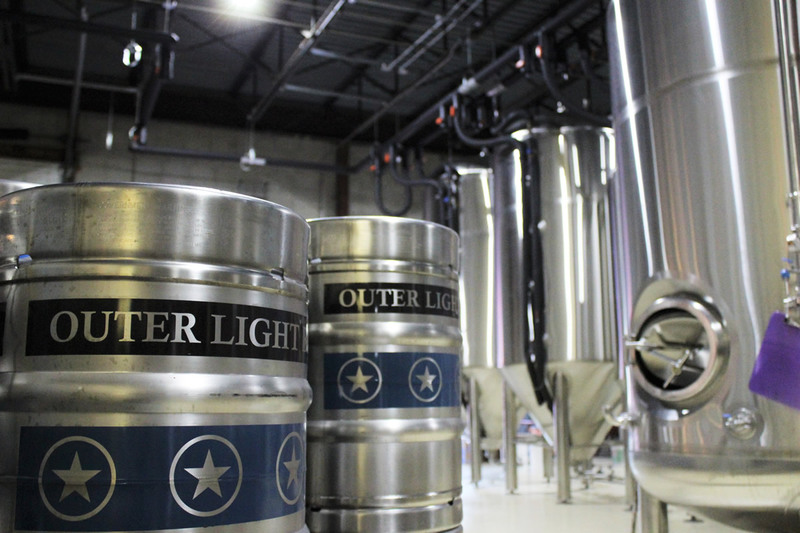 The idea for Outer Light Brewing Company was born in that moment.